Hey Mr Vedovini, I am very happy to see that your app seems to meet some success. 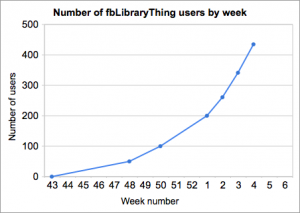 As a Librarything and Facebook user, I must recognize that I love it! LT users have been waiting for such an app for months and I really can’t understand why they have not been proposing any : it was really a huge expectation! I also really consider their absence of reaction disappointing. They might have been developing something official and they are bored you published something before with great quality ? Also, if I may help your viral growth, I made a post on my blog and one on the LT forum (both in french).